Eighteenth episode of Deadmau5 and friends on a Coffee Run. This episode features the infamous Toronto Mayor, Rob Ford. Electronic Dance Music producer and DJ Deadmau5 has adopted a familiar format over the last months. He calls up his friends and invites them to do a coffee run to his favorite drive-thru coffee stop. He does it all in his Ferrari 458 Italia rigged with a few GoPro cameras. This is a largely unedited, raw glimpse into the life of Deadmau5 and his friends and they basically talk about anything related to music and what is current in their life. 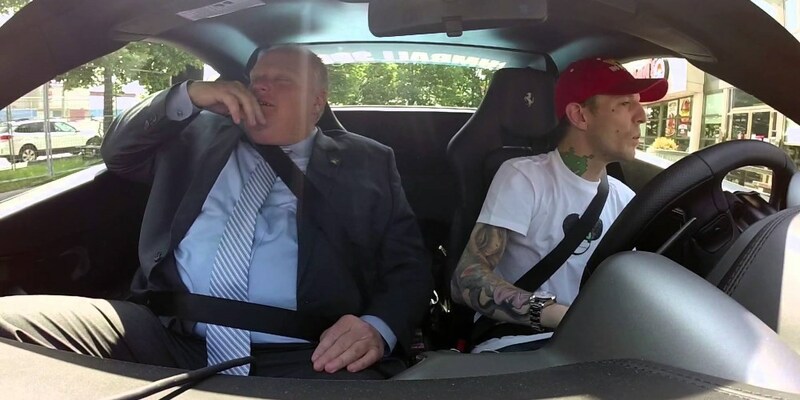 This episode features infamous Toronto Mayor, Rob Ford. They are cruising Toronto getting some coffee, as usual. They talk about everything from Gumball 3000, road rage, speeding, coffee, city planning and how it is running the city of Toronto. This is the eighteenth episode so the format is tried and tested, but a more interesting format for interviews than many others out there.